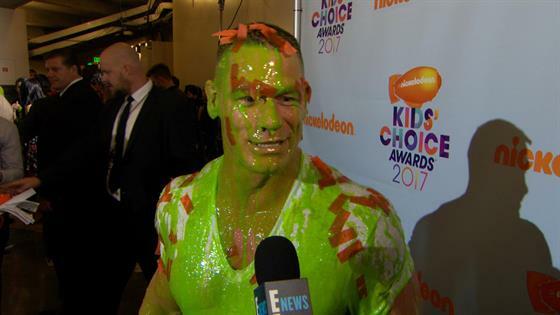 2017 Kids' Choice Awards Host John Cena Gets Slimed! Are you ready to see stars get slimed! The 2019 Kids' Choice Awards take place on Saturday and will feature your favorite—and perhaps, not so favorite—celebs getting covered in sticky green goo. DJ Khaled is hosting the annual event. The list of celebs set to make appearances include Ariana Grande, Adam Sandler, Chris Pratt, Jason Sudeikis, To All the Boys I Loved Before stars Noah Centineo and Lana Condor, Joey King, Caleb McLaughlin, Kiernan Shipka, Josh Peck, Aladdin's Will Smith, Mena Massoud and Naomi Scott, Shazam! 's Zachary Levi, Asher Angel and Jack Dylan Grazer, plus Nickelodeon stars such as JoJo Siwa, Jace Norman, Scarlet Spencer and Owen Joyner. In addition, Migos, who are nominated for their first Kids' Choice Award in the category of Favorite Music Group, are perform a medley of their hits. Check out pics of celebs getting slimed at the Kids' Choice Awards over the years! The Olympic gymnast get slimed at the 2018 awards! It was 2008 when the screen icon took his first slime in stride. If there was anyone to make you laugh over slime, it's this guy. The star didn't even have to leave her seat to get slimed at the 2012 show. The supermodel couldn't wipe away all of the slime. The 2017 host got hit with a massive dose of slime. It was a sea of slime for the Jonas Brothers and Dwayne "The Rock" Johnson at the 2009 show. The actress powered through the sliming in 2013. The comedian rocked the signature shade of green at the 2017 show. At least they had goggles for protection! The Biebs got totally showered in slime back in 2012. The songstress might be a little sorry she got slimed at the 2017 awards. Back in 2005, the funny man got the slime treatment. The comedian didn't know what he had coming when he got slimed in 2004. The famous twins got a double dose of slime in 2004. The funny man took the slime in stride back in 2002. The songstress got special treatment with pink slime during the 2002 show. The pro snowboarder couldn't ride out of this goo in 2014. The Fresh Prince was freshly coated in slime in 2000. The stars could only embrace for cover when they were hit with the slime in 2001. When it came time to get slimed in 2013, he could only say one thing: dale! The basketball pro got a different kind of dunk when he got covered in slime in 2013. The actor was seeing green at the 1994 show—even his glasses were covered with slime. The pro wrestler couldn't fight the slime in 1999. It was an A-list trio of slime victims in 2007. The late icon and fellow comedian got slammed with the slime in 2006. The funny star embraced the slime in 2005. The actor was the king of the slime in 2011. The Suicide Squad got hit with the slime again in 2012. The singer couldn't hold back the slime in 2015. The singer was leavin' with slime on his shirt in 2009. The A-list stars couldn't dodge the surprise slime in 2009. The 2019 Kids' Choice Awards will air live from the Galen Center in Los Angeles on Saturday, March 23 at 8 p.m. ET on Nickelodeon.